A week ago, I got the opportunity to try out Mega Man 11 for the first time at Fan Expo Canada. I was going to write up my impressions about it shortly afterwards, but then the Mega Man 11 demo for Nintendo Switch dropped, soon followed by Xbox One and PlayStation 4, so I’ve kind of decided to just roll everything from what I’ve played together here. First and foremost, it’s worth noting that the very first thing you see on the home demo is a disclaimer noting that the game is still in development, and that the final gameplay experience may be a little different, so naturally everything which follows here could change by the time Mega Man 11 is available in 22 days. Before diving into the gameplay, let’s do what I always do and check out the options. The demo presents us with some good news: In addition to a host of different text languages and a choice between Japanese and English voices, those who prefer a less vocal experience will find that you can adjust the volume level of the sound effects, music, and voices to your liking — including turning them all the way off. You can also set the controls just about any way you like, and even activate dedicated buttons for sliding and/or rapid fire shooting (a personal favorite). The only problem is that there aren’t enough buttons for everything (Rush Coil takes up the top face button as default), so you may need to sacrifice something. Personally speaking, I moved the Next and Previous Weapon buttons to the L and R bumpers from the triggers, swapping them with the Power Gear and Speed Gear, respectively. I’ve heard some prefer to swap the positions of Power and Speed as well, though I’ve yet to give that option a try myself. It does line up a bit more closely with using L for Dash and R for alternate weapons in the Mega Man Zero games, so that is something to consider. Separate from the other control options is a simple on/off toggle for the new Special Weapon Shortcut that is mapped to the right analog stick. Your mileage may vary according to device, but while I had no problems with it on the Xbox One controller, I did find my hand would occasionally nudge it accidentally on the Right Joy-Con, triggering a weapon change when I didn’t want one. Of course, part of that may have been down to my choice to play as I usually do on the television with one Joy-Con in each hand; I imagine using the Joy-Con Grip might make it less likely to occur, though the stick is nonetheless further to the right than on other controllers. You’re given three of the four available difficulty levels to choose from in the home demo (the one at Fan Expo, which I believe was the E3 demo, had all four available; I only got to try Normal there, however), with Superhero unavailable. If you go to the subscreen (which has a model of Mega Man you can turn around, and lots of detailed descriptions) after starting up, you’ll notice a few differences between the Newcomer and other modes: Not only do you have infinite lives, Beat Calls (calls Beat to save you from a pit), Super Guards (halves damage), and Pierce Protectors (spike protection, not that there’s much need for that in this demo). On top of all that, you’re also equipped with an Energy Balancer right out of the gate — why it’s okay to be standard issue for X but normally needs to be re-acquired every time for Rock remains a mystery to me. It doesn’t even affect the challenge, it’s more a quality-of-life feature, but I digress. Newcomer aside, Casual and Normal seem to be much closer in spec overall, with the former getting five extra lives and the latter only two. Given the generally negative connotation that “Casual” has, I’m a little surprised that they would run with that here. On the other hand, I guess “Advanced” could potentially scare off the very people they hope to attract, though that mode is designated as more for those who haven’t played Mega Man in a while. Which leads to a rather curious thing: As I played the demos at Fan Expo Canada and at home on my Switch, I found that the Casual mode felt a lot more like what I’m used to when playing Mega Man, while the Normal mode is actually fairly challenging at points. I know the series, if not the franchise as a whole, has a reputation for being challenging, but it was a little surprising what was considered the “norm” for the series. It wasn’t unbearable or overwhelming or anything, for the most part, but there were two parts that stuck out to me. One is this room. Blocks move along conveyor belts towards the pits at the bottom, and so you must both avoid them as they fall and also use them to get to higher ground. You can see where they’re going to fall, but the constant movement of the conveyor belts makes keeping to a safe area tricky. 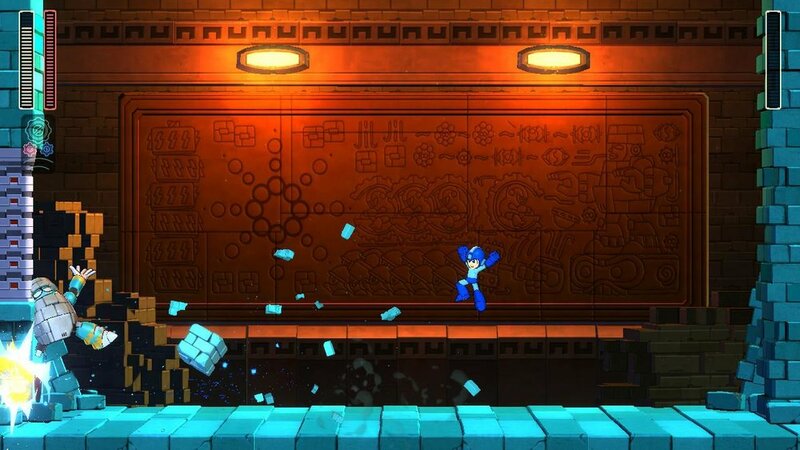 That in itself isn’t so bad, but some have pointed out that Mega Man seems to suffer from an unusual amount of knockback and recovery time after taking a hit — such as what being knocked on the noggin by a giant stone block is likely to do. I never really noticed that much throughout the level, but this room makes it much more apparent. There are two main ways I know of to get through the room: One is to use the blocks as platforms before they fall too far to progress higher and higher, and this is best facilitated by the Speed Gear. It’s not required, but the timing you have is quite minimal without it, and even when using it, your window is still fairly brief, yet just long enough to overheat. The other way is to use Rush at the very edge of the platform at the right to take something of a shortcut, but you have to time it just so that you don’t get hit by a falling block (whose timing is obscured by falling from further upscreen) and potentially knocked into a pit. Fortunately, unlike in Mega Man 7, Rush is a much hardier hound this time around. As you can see above, rather than taking a hit and beaming away, the stone blocks shatter right upon his canine cranium. The other place I ran into a spot of difficulty was with the (Robot) Master of the House himself, Block Man. He bested me in Normal mode, maybe once or twice on Casual, even though I’ve beaten him as many times in kind (in fairness, taking screenshots while trying to dodge high-speed attacks can be tricky). The main problem is with his giant mode, seen above. It’s pretty awesome, but it can also be pretty hard to avoid, depending on placement. If he’s close to you in the corner, it’s tough, and the hit box feels a little… flexible? For example, his left leg above (on our right) bends as he swings his arms, and that movement can turn your safe spot into a danger zone in an instant, making dodging this part a little tricky. 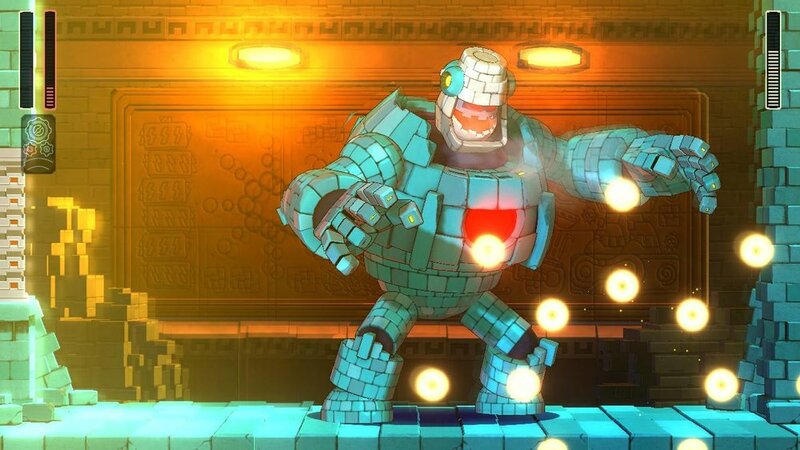 Still, I feel like I’m getting a bit more used to him, and if you can make it past his big blocky brute mode (an E Tank helps), you should be golden, as his regular attacks are pretty easy to dodge by comparison. 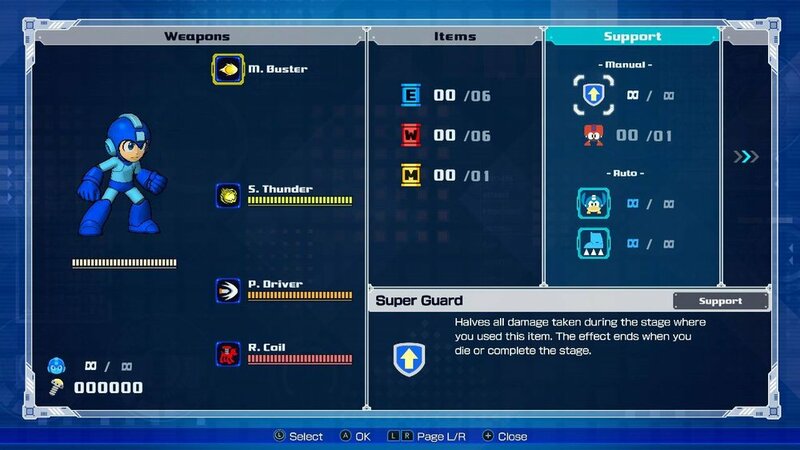 I don’t think they were included in the Fan Expo demo, but in the home demo, you get two Special Weapons along the way: Scramble Thunder and Pile Driver. I thought that the latter — a dashing jackhammer maneuver — would be the weakness for a guy made of stone blocks, but it didn’t seem very effective overall. At least, not against his big mode, which is when you need an edge the most. Ah, but this game is all about having that edge, isn’t it? To be honest, I didn’t find myself needing to use either the Speed Gear nor the Power Gear very much — I toyed around when them a little during the stage, mostly the Speed Gear to try to take out those rolling guys (it’s just altogether easier just to jump over them) and get through the aforementioned block-conveyor belt section before just deciding to Rush through. But I did decide to try using the Power Gear against Block Man when he put on his big-boy pants, and I didn’t quite get the result I expected. Before activating, I charged up the Mega Buster, and when I hit the trigger? I think the charge dissipated. I’m not entirely sure, but I think you have to begin charging after activating the Power Gear to get the super shot seem in the trailers. Which is a pretty short window, as you have to wait until you’re clear, activate the gear, make sure you don’t get hit by anything still, charge it up, wait for it to charge to an even higher level than usual, release the shot (and hope it’s aimed well), then shut the whole thing down before it overloads, temporarily crippling your charge shot. I’m still working on that last part. It’s a bit of a hat trick, though not impossible to do. Either way, I found it didn’t seem to help against the blocky brute as much as I’d hoped during our encounters. Maybe I just need more practice with it. Fortunately, as Capcom promised, using the gears isn’t a requirement for getting through, as some people are posting their gearless runs through the stages already. Following that, you’re treated to the spoils of your victory: The Block Dropper, which you can toy around with in a “simulation” setting against respawning enemies. It would be nice if you could replay this lone stage (the folks at PAX that same weekend got several stages — go figure) through again with the Block Dropper for funsies, but alas, that’s not to be. Beyond the stage itself, which was fine aside from the two points mentioned above — good ol’ fashioned Mega Man run ‘n gunning — I’m compelled to talk about the feel of the game, of controlling Mega Man himself. If I’m being honest, something feels a little off. Not bad, just off. The controls are as tight and responsive as ever, yet something about it didn’t quite mesh with my muscle memory. Those of you who have watched my livestreams of Mega Man Legacy Collection know I’m a pretty good shot when it comes to nailing floating enemies with the Mega Buster, but I found it just a little more difficult to land uncharged shots here. But as I said, it doesn’t feel bad or necessarily imprecise, just different. My thinking is like what Mega Man 7 and Mega Man 8 are to the rest of the series (and each other), so too is Mega Man 11 in this regard. I think I’ll be able to adapt with time, as it was only on rare occasion (usually with those yellow propeller enemies, like the one seen above). Overall, the feeling I take away from the Mega Man 11 demo is largely hopeful, I suppose. 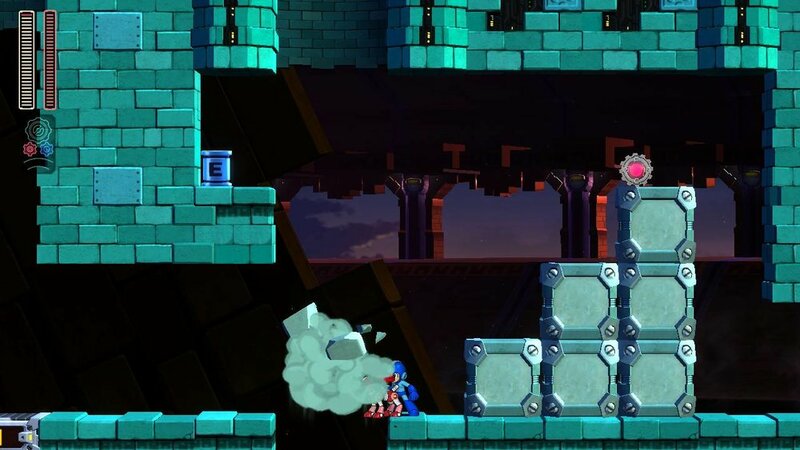 Block Man’s stage was clearly one of the earliest designed, finished, and demonstrated to the public months ago. It’s a little — pardon the expression — rocky in parts, but is overall solid and fun, and I can’t wait to try out more when the game is released on October 2nd.